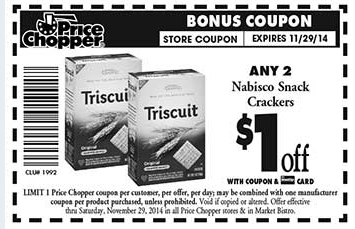 HOT $0.50/1 ANY Nabisco Product Plus $0.50 & $1 Deals! Starting Sunday Wheat Thins will be on sale for $2 at Price Chopper, combine w/ $1/2 store coupon = $0.50 each! Ritz Crackers will be on sale for $2.50, combine w/ $1/2 store coupon = $1 each! where is this bonus coupon. I am going to the store and can not find it. It's nla now, so you would have to have printed it earlier. I'll update the post.